Last night was all about the app. 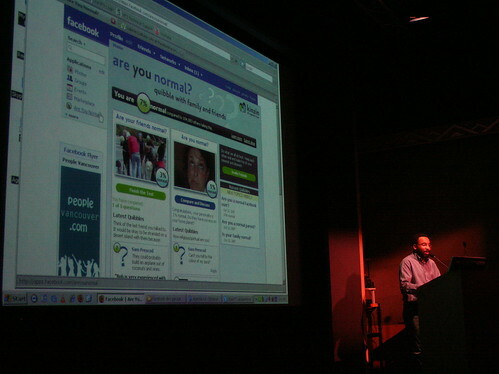 Vancouver, or more recently referred to as “Techcouver”, held its’ first Facebook Developer Garage event downtown at the Vancouver Film School. 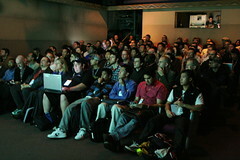 The event was completely “sold-out” by over double the capacity of the space, so there wasn’t a seat to be had. Once the Nazi-tech guy made his way from the floor back to the booth for the main event to commence, people began to fill the isles and find space wherever they could. It was a packed house. There were about 9 Facebook applications in all that were on display over the 3 hours. Each developer, or team of developers, grabbed the spotlight for a 10-minute overview of their respective app and covered any technical aspects worth mentioning and sharing, followed by a brief Q and A for each. David Morin, Senior Platform Manager for Facebook (nice title buddy) was meant to be joining us in the flesh for our inaugural evening, but had to cancel 48 hours in advance due to some “big meeting” at HQ. But he was kind enough to take a few minutes out to appear via Skype Video, as he said a few nice words, opened it up to the floor for some questions, when sadly, the connection was lost. 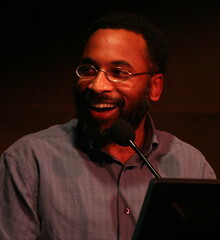 Paul Prescod, ‘DAD’ at Kinzin, shared the “Are You Normal?” app with the crowd. When he gave the current-users statistics (now over 114K in 3 short weeks), there was a gasp as a hush fell over the room. Well, maybe that’s a bit of a stretch. But nonetheless, impressive stuff! Johnny Bufu and Boris Mann wrapped the night with a few words on the open web. Facebook? Open?? There is a complete breakdown of each presentation on the live blog post from Miss 604, and on Roland Tanglao’s Jaiku Channel. Today marks The United Nations Day for the Eradication of Poverty. To make your difference, join millions around the world as they STAND UP and SPEAK OUT to Make Poverty History. This event, STAND UP, has been issued by the Global Call to Action Against Poverty and the United Nations Millennium Campaign. You could perhaps sail the Nile, but if that’s not quite possible and you’ve run out of time to arrange a formal gathering of participation, you can find a local event to take part in, or be spontaneous wherever this day finds you – whether you are around a dinner table with family or friends, in a store, a section of a restaurant, a bank line-up – share your plight and record the number of people you engage in standing for one minute for “Standing Against Poverty”. Or (and this is likely the easiest way) just click here and show your support as an individual. Record all and any of your support here. On the 18th of October at 8pm the OXFAM Party Against Poverty, to be held at the Plaza Club at 881 Granville St., will feature Murray Atkinson, Hey Ocean!, Lotus Child, The Wassabi Collective, and Freeflow. Tickets are $14 in advance and $20 at the door. Proceeds will go to Oxfam Canada. For more information contact Miriam at 604-736-7678 or miriamp@oxfam.ca . Are You Normal? OVER 30K in 2 Weeks! Just wrapping week 2 since launch, and “Are You Normal?” is one of the fastest growing Facebook apps cookin’, from this northern hub of “Techcouver”. Recently added is a new, fresh design and more surveys will be added each week. Would you like to write for one of the fastest growing Facebook applications? We reward you and your creative savvy on our application and LINK to your personal Facebook profile, if that is kosher. If not, just let us know you’d rather remain unlinked. And I got the boot with pretty minimal activity. I’ve heard about other people who have had similar experiences, but I was under the impression it was to do with blasting your whole contact list at once, hence the rule to invite only 10 friends a day into an application. I was ‘facebooking’ a detailed note, work related, to about 15 people. Yes, I understand the “share on facebook” method, and yes I get you can forward one note to a lot of people. But I wanted my note to be BCC’ed. Something I don’t think Facebook has the capabilities of just yet. And if they do, boy did I miss that day at school. I’m assuming that they do have some sort of “make this private”, but I never dreamed a handful of notes would cause such a ruckus. Anyhow, I fired an email off to the support people and got a lovely note back saying my situation is being reviewed, with a case number and all. And so I wait. Feeling like a criminal. Perhaps now I can get back to those things I turfed aside due to my 2007 addiction.